The Czech engraver Wenceslaus Hollar (1607–1677) lived in England and became one of the best artists of his time. He was prolific, executing some 400 drawings and 3000 etchings. 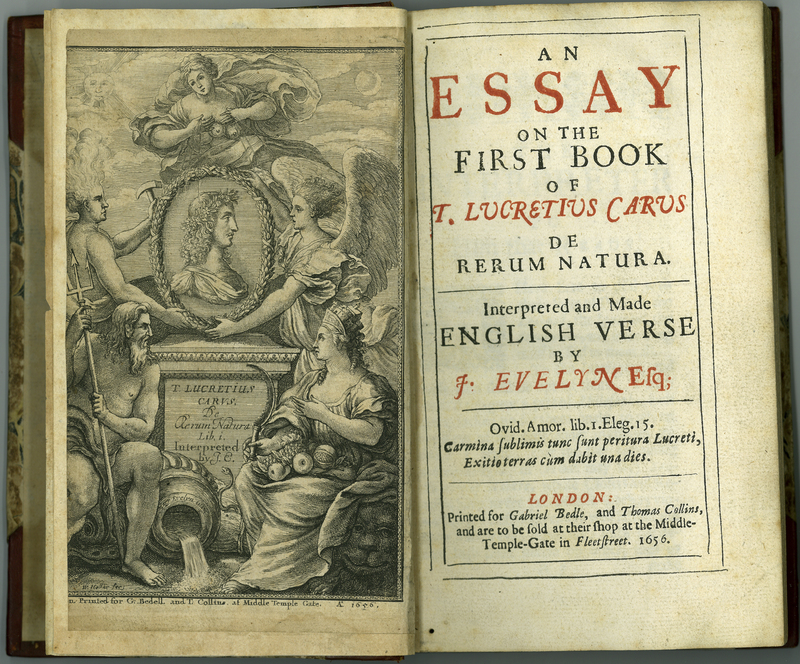 He engraved the allegorical frontispiece to John Evelyn’s Essay on the First Book of T. Lucretius, its first appearance in English. The frontispiece was designed by Mary, Evelyn’s wife. Evelyn had training as a draftsman and he must have given her some instruction on composition. Although the head in profile in the wreathed medallion is supposed to be Lucretius, it is, as commentators have noted, very much like Evelyn himself. John Evelyn, “An Essay on the First Book of T. Lucretius Carus De Rerum Natura,” ourheritage.ac.nz | OUR Heritage, accessed April 20, 2019, http://ourheritage.ac.nz/items/show/10674.